Welcome to the MELTS Web site. Here you can find information on using MELTS software packages and related tools. Which version of MELTS should you use? MELTS software is now open source! Go to Gitlab for details. Try the MELTS web services. rhyolite-MELTS not working correctly after an upgrade? See this support document. Download the MELTS for Excel workbook. Get MagmaSat and MagmaSatApp (iPad) from the . Download rhyolite-MELTS (containing the new H2O-CO2 fluid saturation model) and pMELTS. Download the updated pMELTS and rhyolite-MELTS for Ubuntu 14.04 and RedHat 6.7 (32- and 64-bit). MELTS is a software package designed to facilitate thermodynamic modeling of phase equilibria in magmatic systems. It provides the ability to compute equilibrium phase relations for igneous systems over the temperature range 500-2000 °C and the pressure range 0-2 GPa. Evolution scenarios for magmatic processes can be modeled with MELTS as a series of steps in temperature and pressure (Gibbs energy minimization), temperature and volume (Helmholtz energy minimization), enthalpy and pressure (entropy maximization) or entropy and pressure (enthalpy minimization). Isenthalpic (constant enthalpy), isentropic (constant entropy) or isochoric (constant volume) scenarios can be utilized to explore magmatic processes such as energy constrained assimilation, adiabatic decompression melting, or post-entrapment crystallization in phenocryst melt inclusions. Optionally, equilibrium can be computed in systems open to oxygen transfer at fixed chemical potential (fugacity) of oxygen. This allows both equilibrium and fractional crystallization of magmas to be modeled along a specified oxygen buffer. Water is included as a component in the liquid phase and as a separate pure phase; solubility relations can be modeled as a function of temperature pressure and liquid composition, and the effect of water on phase equilibria is included in the model. The thermodynamic model for the liquid phase included in the MELTS package was fitted largely from low-pressure experimental phase equilibria and an independent set of thermodynamic data/models for mineral phases. MELTS is intended for modeling magmatic phase relations at low pressure (< 2 GPa). It is better calibrated in mafic systems and should work especially well for MORBS and alkalic mafic magmas. Phase equilibria involving hornblende and biotite are not modeled well by the MELTS package. and consequently simulating the evolution of intermediate to silica-rich calc-alkaline systems is not recommended. MELTS is based upon the work of Ghiorso and Sack (1995) and Asimow and Ghiorso (1998). Rhyolite-MELTS is identical to the MELTS calibration except that the enthalpies of formation of both quartz and endmember KAlSi3O8 in feldspar solid solution have been adjusted. This was done in order to model invariant behavior in naturally occurring liquids that approximate compositions in the water-saturated quartz-two-feldspar ternary. Rhyolite-MELTS should be used in place of MELTS for modeling phase relations in hydrous silicic systems. Rhyolite-MELTS is not suitable for near or sub-solidus phase equilibria, nor is it suitable for intermediate composition liquids whose phase assemblages are dominated by the presence of hornblende or biotite. Pressure restrictions for calculations are identical to MELTS. The numerical algorithms for detection of phase saturation and energy convergence have been altered in rhyolite-MELTS to substantially improve computational stability. Rhyolite-MELTS is based on the work of Gualda, Ghiorso, Lemons and Carley (2012). Rhyolite-MELTS has been released in three versions. 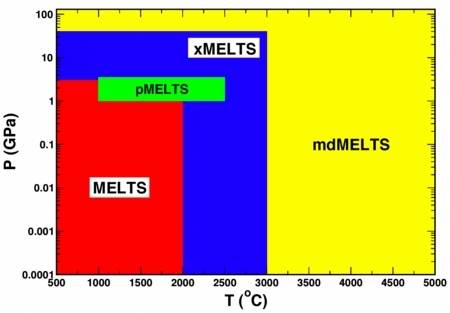 pMELTS is a revised calibration of the liquid thermodynamic model in MELTS and is optimized for mantle bulk compositions. pMELTS is calibrated from an extended experimental database that includes more extensive data at elevated pressure. pMELTS is optimized for "mantle-like" bulk compositions at near solidus conditions (0-30% melting) and is intended to be applied over the temperature range 1000-2500°C and the pressure interval 1-3 GPa. Much above this pressure the model will fail because of limitations inherent with the liquid equation of state. The use of pMELTS at pressures below 1 GPa is not recommended, and great caution should be exercised in applying pMELTS to intermediate or silicic bulk compositions. The modeling capabilities of the pMELTS software package are identical to those of MELTS. pMELTS is based upon the work of Ghiorso, Hirschmann, Reiners and Kress (2002). Q. How can I run MELTS, rhyolite-MELTS or pMELTS? Standalone: If you use a UNIX-based computer (e.g., a system running Linux or Mac OS X), download a standalone version that generates results on your own computer. Go to the UNIX page or Mac OS X page . (Recommended) Phase Properties applets. These applets were developed as part of a related project and are available on the CT server Web site. The interface functions more like the standalone versions of MELTS. These applets have better client-server communication that functions through firewalls. And, the server has been completely redesigned to enhance stability and throughput. alphaMELTS: Paul Asimow and Paula Antoshechkina have created a scripted version of MELTS that runs on UNIX systems (including Mac OS X and Linux) and machines running Windows. alphaMELTS includes the ability to model water solubility in mantle minerals and the effect of water on the mantle solidus. For more information and instructions, see the CalTech alphaMELTS Web site. Standalone: If you use Mac OS 10.8+, you may download a standalone version of the executable program. Go to MELTS for Mac OS X page for instructions. Ubuntu-based UNIX versions of rhyolite-MELTS may be downloaded from the UNIX MELTS page. MELTS for Excel on Windows: If you have access to Excel 2010 or 2013 running on a Windows platform, you can download a macro-enabled Excel workbook that serves as a front end graphical user interface to a server at OFM Research that runs MELTS web services. Go to MELTS for Excel for instructions. For help with the standalone MELTS/pMELTS, see MELTS Manual. Q. How can I find out the thermodynamic properties of phases that MELTS, rhyolite-MELTS and pMELTS know about? Q. Which experimental database is MELTS, rhyolite-MELTS and pMELTS based upon? Please see pMELTS Experimental Database. Q. What are the plans for extending MELTS and pMELTS to higher pressures and temperatures? The following figure illustrates future plans for extending MELTS to a broader range of temperature and pressure conditions. xMELTS is the code name for a project involving Ghiorso (at OFM Research Inc.), Marc Hirschmann (at the University of Minnesota) and Tim Grove (at M.I.T). The aim is to create an entirely new liquid model that incorporates recently completed work on the liquid equation of state (American Journal of Science, v 304, no 8-9, 2004) and an associated solution formalism that together should facilitate modeling liquid properties from 0.0001 to 40 GPa and 500° to 3000°C. The intended use of xMELTS is as a replacement for MELTS and pMELTS that will extend modeling capabilities to the top of the Earth's lower mantle. One aspect of the xMELTS project is the generation of a comprehensive, up-to-date database of liquid-solid experimental phase equilibrium data. This database is called LEPR, which stands for Library of Experimental Phase Relations, and is accessible at lepr.ofm-research.org. The release of xMELTS is pending while solution models are under development for high-pressure garnets and pyroxenes. This work is being undertaken jointly with researchers at CalTech. The mdMELTS project is a far reaching vision of extending MELTS modeling capabilities down to the base of the Earth's lower mantle. While the "x" in xMELTS stands for extreme, the "md" in mdMELTS stands for molecular dynamics (MD). This project is being undertaken by Ghiorso (at OFM Research Inc.) and Frank Spera (at UC Santa Barbara) and is as yet unfunded. The idea is to extend the silicate liquid equation of state calibration to very high pressure (and temperature) utilizing MD computer simulations of liquids. This will allow liquid-solid phase equilibria to be modeled at high pressure. Our preliminary work on this project is focusing on the system MgO-SiO2. As results and models become available, they will be posted to this web site. Q. Which references must I cite when I publish results based upon MELTS, rhyolite-MELTS or pMELTS? Unlike Athena, MELTS,89/= rhyolite-MELTS and pMELTS did not suddenly emerge — fully formed — from the forehead of Zeus. When you use results from MELTS, rhyolite-MELTS or pMELTS in a publication, abstract or talk, please cite the appropriate reference(s).